Shrubs and trees we grow sometimes suffer from diseases and viruses. While there is little you can do to stop a virus, if your plant is an ornamental there are some preventative measures, and although not cures, ways to manage the disease of a beloved plant. There are some organic cures for food plants, which I will list as often as possible. 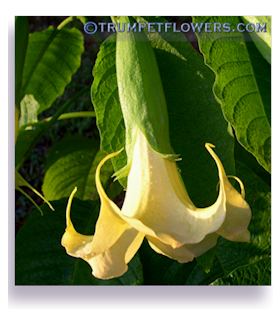 These are some things I&apos;ve gathered together on things that can sometimes affect brugmansia. 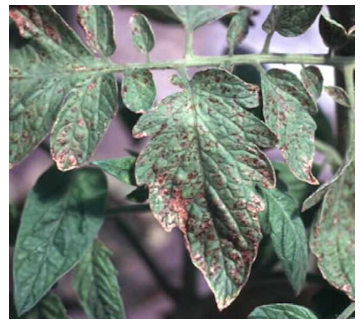 Anthracnose is mostly a tomato disease that is caused by the fungus Colletotrichum coccodes. Because Brugmansia are also solanaceae, this is a fungus to be on the lookout for. Bayer Insect, Disease and Mite Control will help with prevention. Use as directed. You can find it in almost all big box and home improvement stores. Mancozeb or Daconil will also do the trick. Copper fungicides and Bordeaux sprays can also help keep this under control, or stop it altogether if you begin treating it before the spring rains. 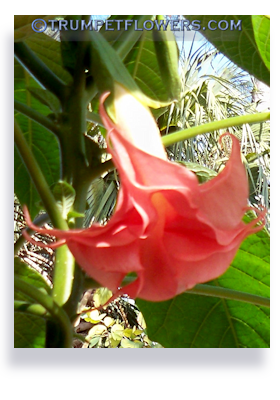 You can also help your plants by keeping all brugmansia leaves and blossoms picked up and put either to compost (if unaffected) or garbage. Being diligent about cleanup is neccessary because part of the life cylce of anthracnose is living in the leaf debris. Here it overwinters, only to come out and attack your plants in spring, when the rains begin. Because it overwinters in this manner, if your plants become infected it is best not to use the debris in the compost heap.Instead, burn or bag them. Bacterial Leaf Spot. This is caused by the bacteria Xanthomonas campestris pv. hederae. It seems to form most in areas where there is a lot of humidity and watering of plants. Help prevent further spread by not wetting the leaves of the plant, which seems to cause it to spread.Also make sure your plants are not too close together, so that air circulation is improved. Remove any affected leaves and either burn them or tie them up in a plastic bag and throw out promptly. Wash your hands before touching other plants. The use of anti∼fungicides like actinovate also help stop it and keep it from spreading. Actinovate is a natural, organic bacteria that eat the fungus, so this could be used on food plants as well. Use as directed, and keep an eye out for this on surrounding plants and treat them right away. Begin a ritual of using a Copper Fungicide Spray before the problem even arises. Use the same schedule as for Blight treatment. Learn how can make your own Copper Fungicide Mix for spraying here. Another excellent product that will get rid of Leaf spot, is Docket DF - Generic Daconil Fungicide. It fights many other forms of fungus too, including Dollar Spot, Melting-Out, Brown Blight, Flower blight, leaf blight, Ink spot, powdery mildews, rusts, scab, taphrina blister, Brown Patch, Gray Leafspot, Red Thread, Anthracnose, Copper Spot, Stem Rust, and others. Docket DF - Generic Daconil Fungicide also comes with warnings. Be sure to read them before application. If you were page jumped for info on CDV, please try here. 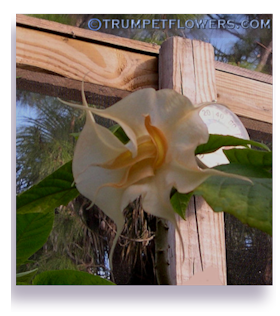 Columbian Datura Virus I moved the information to a more appropriate page. Here in S.W. Florida, powdery mildew can become an issue if not kept under control. There are several products on the market for this, and using any of the treatments above will work, if done in anticipation, or prevention of downy mildew. Powdery Mildew is different than Downy Mildew, and affect the plant in the same way. If it is on top of your leaves, it&apos;s Powdery fungi. If it is on the underside, then just like the name Downy, it is probably Downy Mildew. Fight both the same. If you already see that you have it appearing, you should begin a regiment of spraying for it with a product such as Mancozeb. 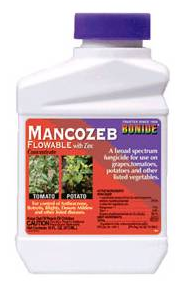 Mancozeb contains zinc, manganese, and ethylene bisdithlocarbamate ion, which fights downy mildew very well. It works best when used in conjunction with a systemic that contains myclobutanil. Eagle 20EW Specialty Fungicide contains myclobutanil, and is very good at killing powdery mildew, but must be sprayed with caution. It is great at getting rid of it though. Because it is typically used in lawns, I had to reduce down the math of application. 1/4 fluid ounce mixed with roughly 3 1/3 gallons of water is perfect for a foliar application. If you like, read some reviews on it over at Amazon. Slime Molds are sometimes found in the landscape. Usually located on grass or piles of mulch that have been inundated with water, or too much shade, slime molds appear in many shapes and forms. Some are actually eaten in other countries. But for the most part, slime molds are an indestructable family of fungi that will just have to run their course before disappearing. You can help by allowing the area to dry out, and if possible, get some sunlight in affected spot. 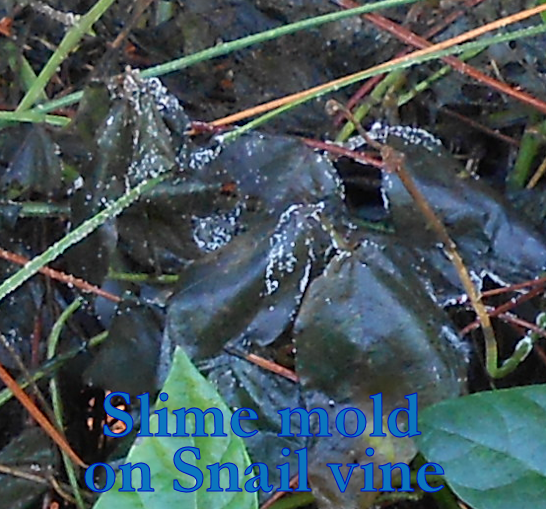 I have recently tried spray a copper fungicide on the snail vine pictured, and will re-treat it in a week. We&apos;ll see. But what I&apos;ve read so far, it isn&apos;t going to help. It has rained so much this summer (2013) that I&apos;m actually hoping for it to stop for a few days so my plants will dry out. I never thought I&apos;d say that! To learn more about fungi, including slime molds, give Tom Volk a visit over at the Wisconsin University. Here&apos;s a link:Tom&apos;s Fungi. Verticillium Wilt is often found in temperate zones of the world, and is actually a soil borne fungi that is able to live long periods of time without a host plant to attack. It goes after the roots of the plant first, and then spreads into the leaves and maybe even some of the stems of your beloved brugmansia. It can also be misdiagnosed as any other number of soil borne fungi, as there are many other types that can give similar symptoms. 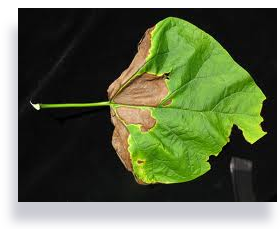 It usually will start to become apparent to your eye at the base of a leaf or two, as a narrow and spreading riangular shaped patch of yellow, then browning, death of leaf tissue. 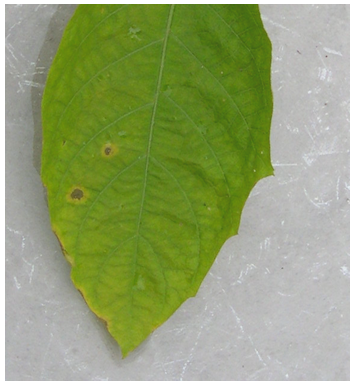 It can also spot the leaf, as shown in photo. Benomyl (Benlate 50 WP) fungicide as a root dip has been used effectively to stop this fungi from entering new seedlings or root cuttings. But the roots that appear later on are still susceptible. It does give the small plant a fighting chance. Better methods for halting this fungus is making sure your soil mix is sterilized (through heat) and using good greenhouse practices. This would include properly disposing of contaminated soils, bleaching out reuseable potting containers, and deeping the growing area free of leaf litterand pests that might help spread it. Bayer has a product called Movento. 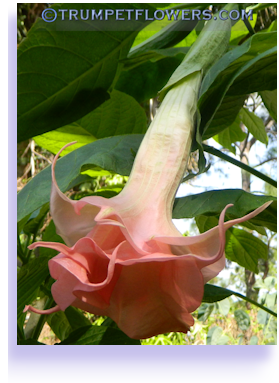 It is a systemic that is used on food crops such as tomato and potato, both relatives of the brugmansia. You can purchase it online here: DoubleAVineyards. You can sometimes find it in smaller quantities, (therefore more affordable) in the European EBay section. Try keywording spirotetramat. 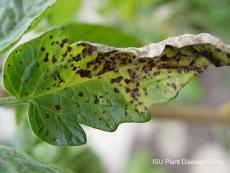 Blight, or Early Blight is often found in solanaceae plants like tomatoes and potatoes. 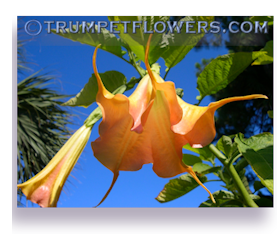 Because Brugmansia is a close relative, you will need to keep your eyes open for this in your collection of angel trumpets too. Rainy season is also a welcome mat to this fungus. Blight will need to be controlled as soon as you see the first signs of it. However, it is much better if you begin an early spring spraying of the Copper Fungicide beforehand. It can also be thwarted by spraying copper fungicides at appropriate times of the year. Begin spraying the plants two weeks before the fungus season in your area begins, and repeat the spray treatment every 5 to 7 days throughout the season. The morning you are going to begin, wait to spray until after the dew has just lifted off of the leaves of the plants. Spray them thoroughly with the Copper fungicide. Make sure to get the trunk at soil level, and also the underneath side of the leaves. Do this before the temperatures rise over 80°. Also try to do it on a day that you don&apos;t expect rain. Letting the copper soak into the leaves and stay for at least a 12 hour period is desirable. 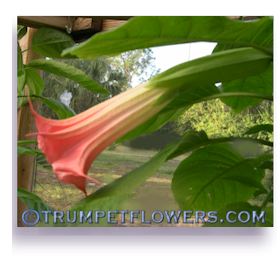 The next day remove any yellowing leaves on the brugmansia. Make sure it gets good air circulation. If you are using clippers to remove branches and have more than one plant, dip the blades into rubbing alcohol before moving onto your next plant. 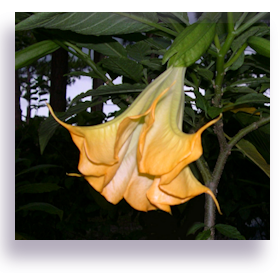 Discard the leaves properly, and pick up any leaves and debris that are around your brugmansia collection. Keeping their area clear of debris goes a long way in halting fungal (and insect) activity. At the end of the growing season, I repot and give new soil to the brugmansia. Copper buildup in soil is not good for plants, so use sparingly. For other forms of prevention and more information on Blight, try this read over at the Iowa State University.Here&apos;s a great read on Late Blight in Tomatoes, which being so closely related to brugmansia, warrants the same attention. As an alternative to Copper Fungicides, you could also use Docket DF - Generic Daconil Fungicide. This halts Blight as well. 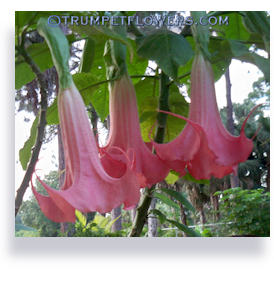 Root rot cause in brugmansia is caused by several different species of a fungus like organism, Pythium.There are several strains of pythium, and can be found in soil, sand, open fields, water and other waterways, even the roots of dead plants and crops. It can easily be transmitted through unclean greenhouse practices, such as not wiping your pruning shears or scissors with alcohol after each use, or reusing potting soils that were contaminated. You can even find Pythium in commercial soiless mixes you have purchased. So it can be hard to get away from these &apos;critters&apos;. Rhizoctonia fungus can also cause Root rot. And Rhizoctonia effects can even be seen above the soil line, on the stems and trunk of the Brugmanisa. Still another fungus, Thielaviopsis, causes what is called Black Root Rot. But there is help for Pythium, Thielaviopsis and Rhizoctonia outbreaks. An excellent treatment for this potential Brugmansia killer is Banrot. It is available from Amazon and other Fungicides suppliers across the internet. 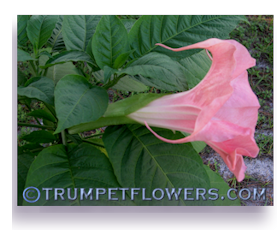 Another good reason to purchase this systemic is that it kills many fungalproblems we angel trumpet growers face. 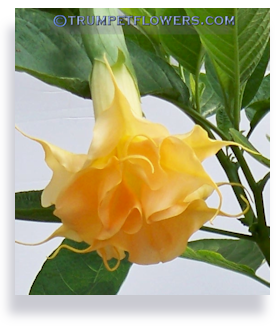 It address Fusarium Wilt, various Root rot fungi, and in brugmansia, also controls/kills Stem blight. For smaller useage amount of Banrot, I mix 1 1/4 oz. to 12 gallons of water. Banrot is a soil-drench. Make sure to suit up as the label proclaims. Finally, may I say that these types of diseases are why I am so for taking stem cuttings as soon as possible on any brugmansia that you wish to keep in the future. Taking healthy cuttings and rooting them up, keeping them away from the mother plants, which may become infected, can help you in times of trouble. 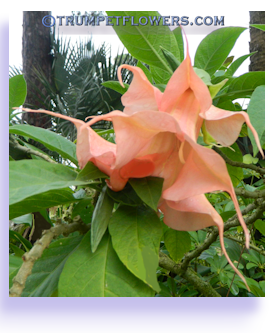 I would remove infected mother or other brugmansia to the trash pile, and allow a healthy cutting to become the new mother. Cycling the plants like this keeps your collection vibrant and disease free. When pruning, make sure to dip the blades in rubbing alcohol and then dry them off between plants. Keep leaf debris picked up,and repot them when they need it. You can dust regular household use ground cinnamon on the soil surface to discourage the growth of molds and halt the activity of fungus gnats. Always use Osmocote pellets to make sure the plant is at it&apos;s strongest. 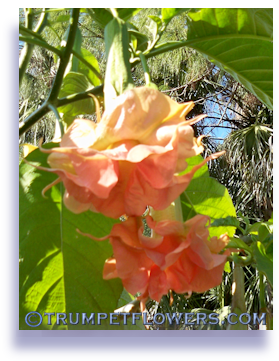 Replace them every 3 or 4 months to keep the micro and macronutrients available to the brugmansia. Doing these things can prevent fungal problems before they start. At the end of each season, do a thorough cleanup of your greenhouse. Use a product such as Hydrofarm PSPH8 Physan 20 Broad Range Disinfectant to sterilize all of your equipment, pots, planters, and anything else that might come in contact with your brugmansia collection. Repot your brugmansia when they need it. Overcrowded root conditions cause roots to become weak and sick. Keep the plants well fertilized. 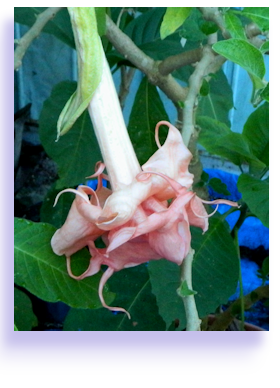 Foliar Feed your brugmansia. They thrive when this practice is used. Prune back dead or dying wood. 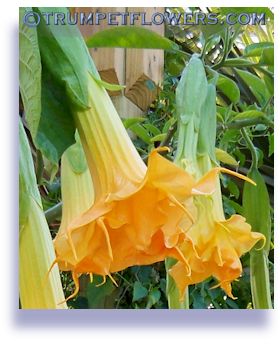 For many fungus problems of brugmansia, I have used Bayer Insect, Disease and Mite Control. If you are just starting out, this stuff can be had immediatley. Below is a list of the fungal diseases it does actually help to control. Try starting out early in the growing season with it, so you will not have a problem to start with. It does work if used as directed. This is available without having to make any special orders, and can be found at Lowes, Home Depot, Walmart, Target, etc. Finally, since brugmansia can get all of the tomato diseases, and they are much more researched that angel trumpets, you can try a look over at Texas AMU Agrilife Tomato Problem Solver. They have a lot of pictures that might help you in identifying your issues, and some advice. This entry was posted on January 22nd, 2012 and is filed under Plant Pathology.